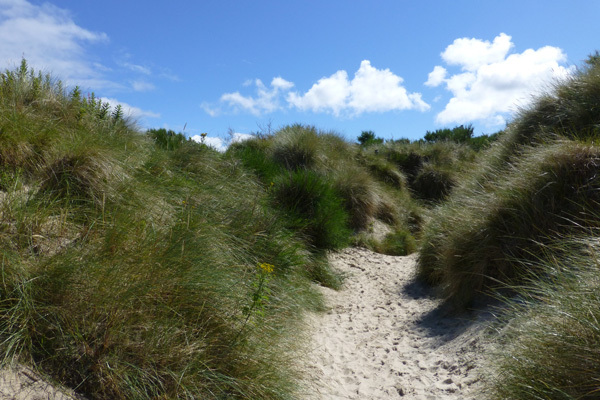 The walk heads across beaches and through marram stabilised dunes, glowing golden with gorse and broom in Spring and early Summer. 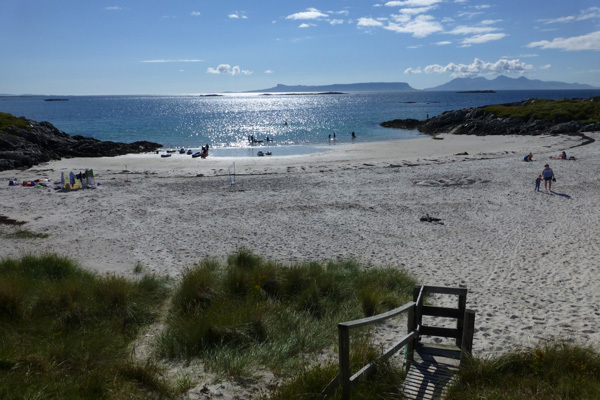 This walk provides an opportunity to explore some lovely beaches and bays along the coastline, with fine views of The Small Isles. 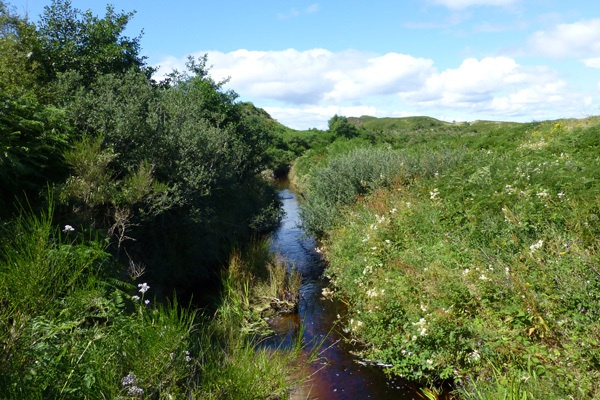 The start of this short walk follows a small stream whose banks are tree lined with alder, birch, rowan, ash and hawthorn, and hued white in Summer from flowering meadowsweet (Filipendula ulmaria) and common valerian (Valeriana officinalis). 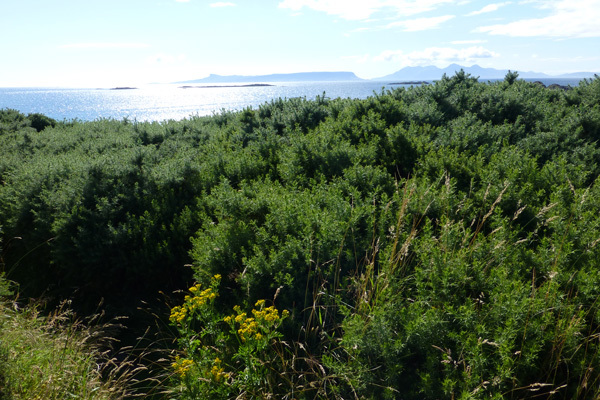 The dunes support innumerable bushes of broom and gorse (Ulex europaeus), together with the dune specialists, marram (Ammophila arenaria), sea couch (Elytrigia juncea) and sand sedge (Carex arenaria), as well as lady’s bedstraw (Galium vernum), yarrow (Achillea millefolium), bird's-foot trefoil (Lotus corniculatus) and species of hawkbits (Leontodon spp), to mention but a few. Grassland higher beyond the dunes is dotted with heather (Calluna vulagris), bell heather (Erica cinerea), tormentil (Potentilla erecta), devil’s bit scabious (Succisa pratensis) and the great wood-rush (Luzula sylvatica). 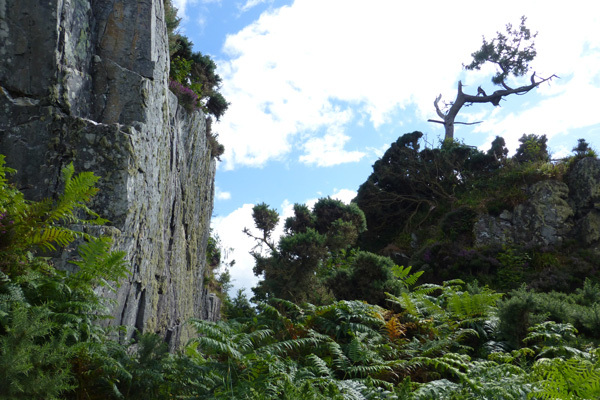 There is also a lovely section through a cleft in the rocks supporting shade loving plants, dominated by dense clumps of great woodrush (Luzula sylvatica), bluebell (Hyacinthoides non-scripta) and ferns (Dryopteris spp). This section merges into a lovely birch copse, with scattered oak and rowan, with an understorey of bluebell, honeysuckle (Lonicera periclymenum) and wood sorrel (Oxalis acetosella), and supporting assemblages of foliose lichens, including the Lobarion. 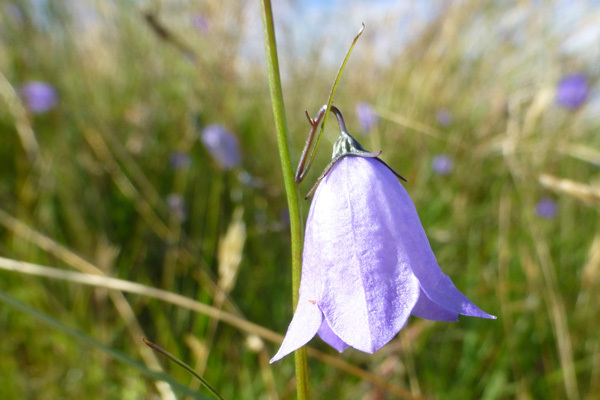 The walk passes through a lovely section of dry nutrient poor grassland supporting harebell (Campanula rotundifolia) (also known as the Scottish bluebell) and viviparous fescue (Festuca vivipara). 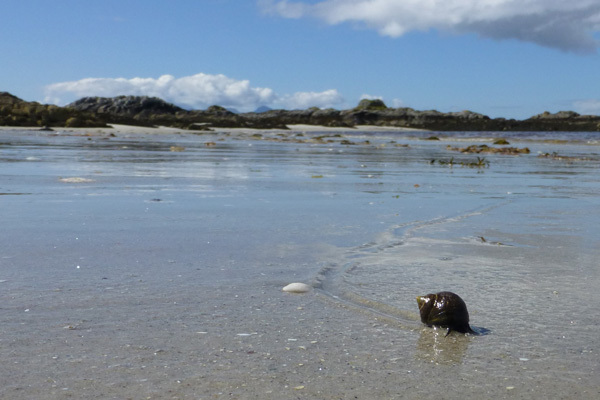 At low tide you can explore the lower shore, fringed with brown wracks (Pelvetia and Fucus spp), with the rocky outcrops crusted with innumerable barnacles, as well as scattered limpets, topshells, whelks and shore crabs. 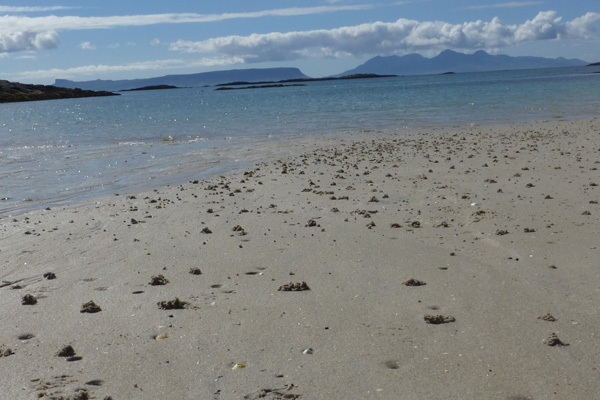 The beaches are sandy although there is a lovely bay at the far end composed of the crushed shells of cockles, limpets, perwinkles and razor clams, affording a great opportunity for a spot of shell collecting. Thrift (Armeria maritime) and sea ivory (Ramalina siliquosa) cling to the ledges and surface of the larger rocky outcrops. 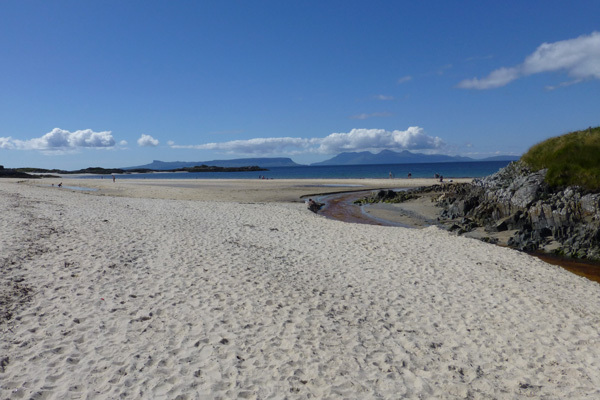 The beach at Camusdarach was made famous in the iconic film Local Hero. 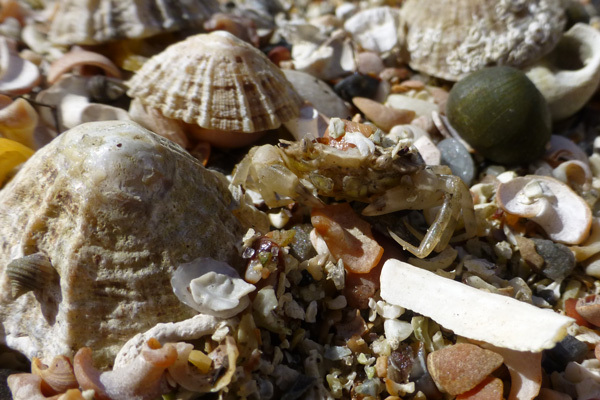 Ben lived in a small wooden hut on the beach making a living from beachcombing. In the film his love for the beach was instrumental in saving the area from development. Just how many grains of sand can you hold in your hand? 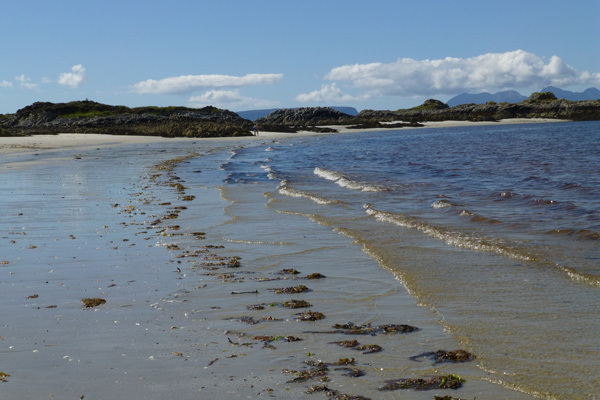 The walk described is best done at low tide affording the opportunity to appreciate the lovely beaches of Camusdarach and beyond. Park at the car park at Casmusdarach, just off the B8008. 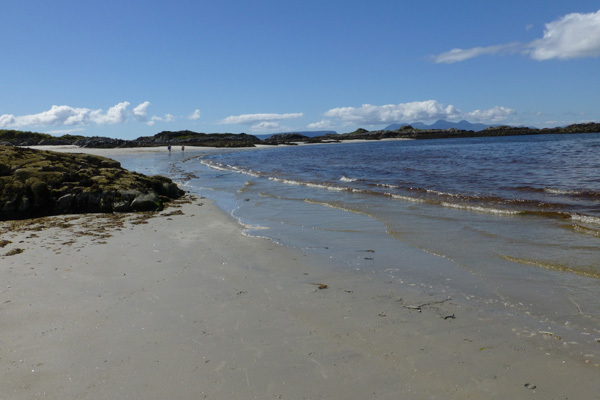 Head across the wooden bridge and through the wooden gate onto a sandy path as signposted. 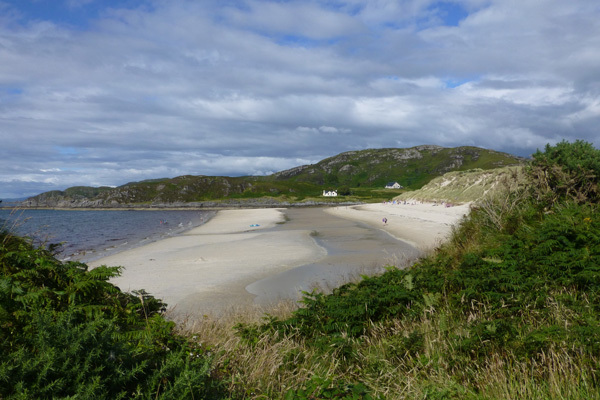 Turn right onto a path that initially follows a stream on a sandy path and then through the dunes and onto the stunning beach of Camusdarach by keeping straight on this path. 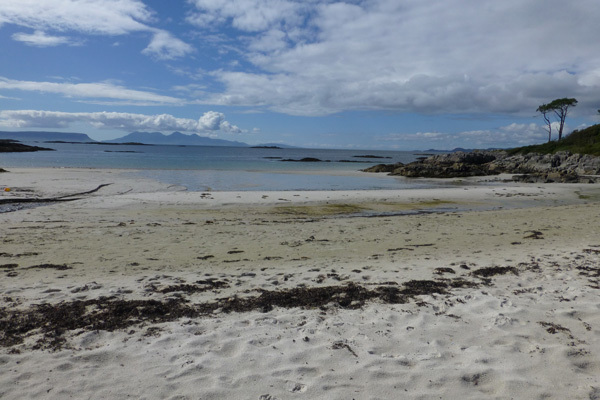 Cross the beach to the rocky promontory at the far end. 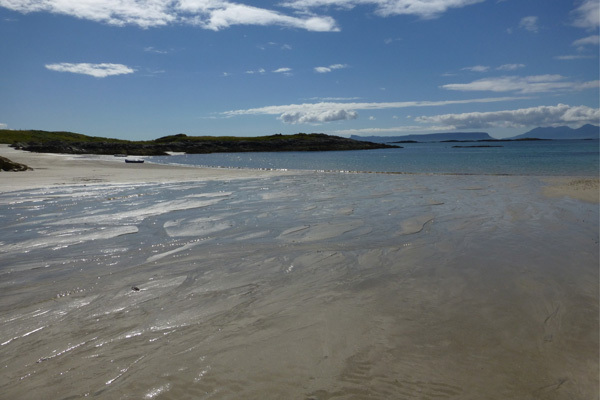 At low tide you can skirt around this promontory and the next heading towards the Rubha da Chuain peninsula. 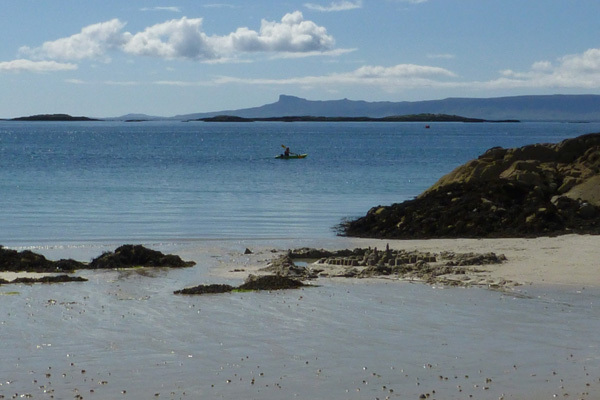 The route skirts by some lovely small bays that afford stunning views of The Small Isles. Take time to explore the peninsula and the lovely bays, before heading towards the dunes by some wooden steps to a metal kissing gate. If you do the walk at high tide, head to the promontory at the far end of the beach and climb over the promontory on the path. Follow the grassy path as it skirts around the next bay before ascending again. Where the path forks, veer left as it heads through gorse dominated dunes, and up to the top of the dunes. Continue on the path until you reach a kissing gate. 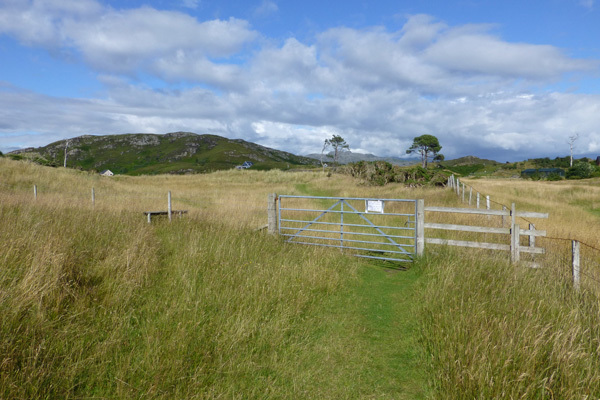 Do not go through the kissing gate but rather turn right following a path along the fence line through coastal grassland dotted with heather, bell heather, tormentil, devil’s bit scabious and the great wood-rush. 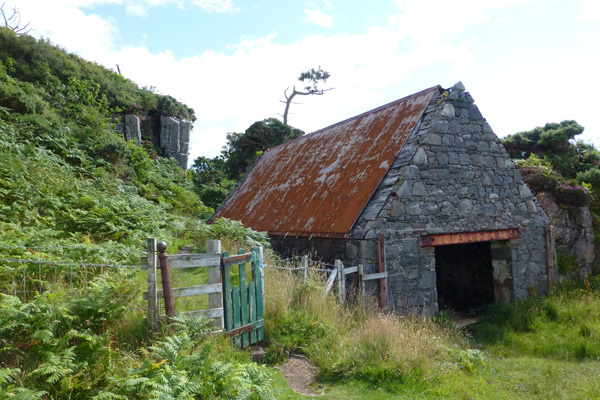 Pass through a wooden gate by a boat house into a shaded cleft between rocks. The path can be very muddy under foot. The path passes through birch woodland before emerging into bracken dominated grassland, with greater bird’s foot trefoil (Lotus pedunculatus), and then onto another sandy beach. 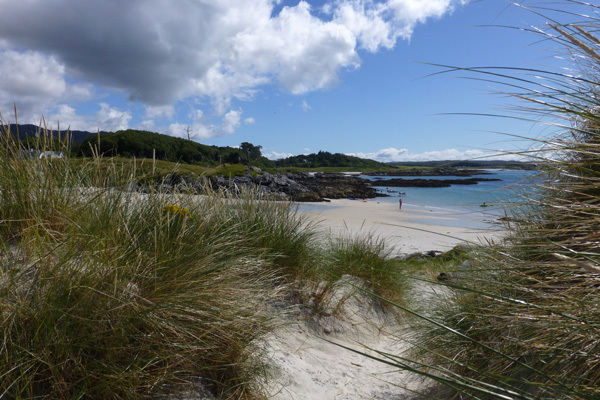 After exploring the beach, continue onwards along a grassy path to explore another stunning sandy bay. 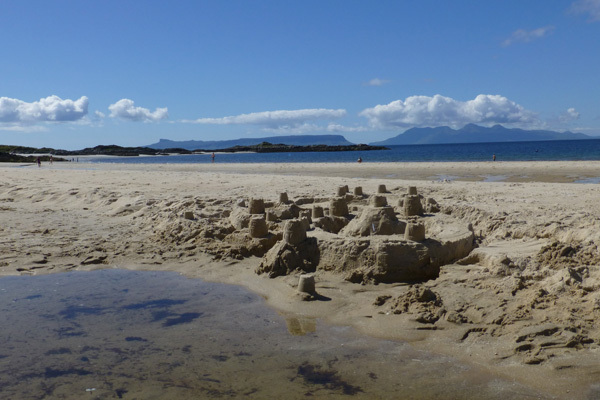 Take time to explore these lovely beaches and take in the stunning scenery. The path finishes where it joins the B8008. 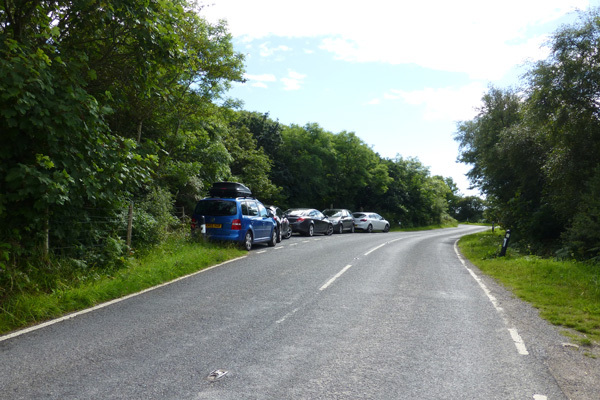 This is an alternative start point for the walk with limited parking possible in a small layby. Return by the same route along the coastal path to the kissing gate. 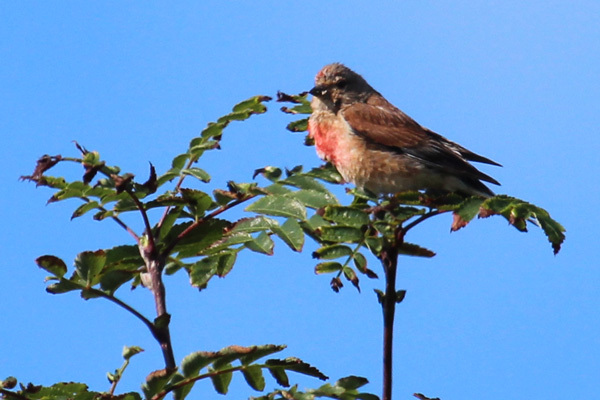 At the kissing gate, continue on the path as it skirts around the fence line and heads inland by keeping right through a gorse dominated dune system. The path descends to a small sandy bay. Skirt around the bay and continue on this undulating path heading inland a little. Pass through a metal gate (or nearby stile) and pick up a faint path on the left through the grassland behind the dunes. 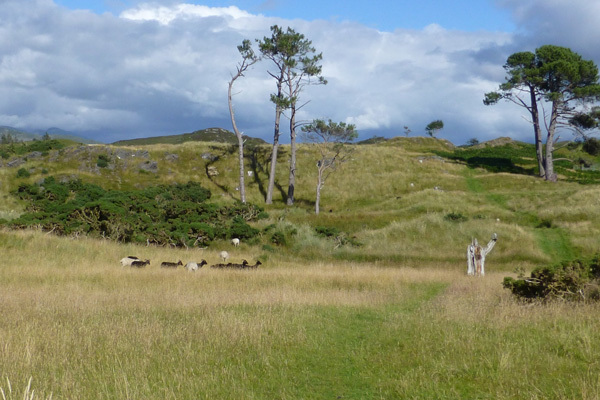 This path passes through grassland and by a small clump of Scots pine. Please keep dogs on leads as there are often sheep in the fields. 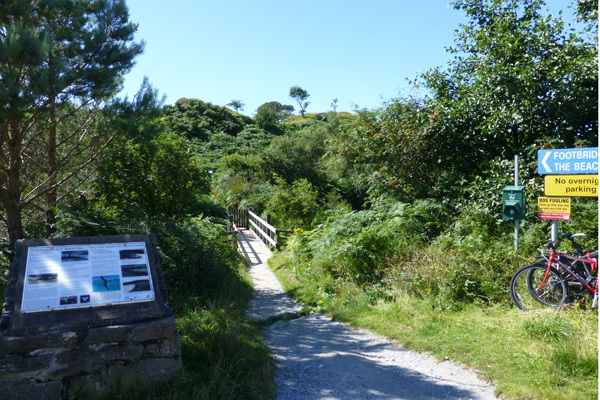 Cross the wooden bridge and follow the path over a small hillock before descending back to the car park.